The following interview with Jason Lollar is an excerpt from Dave Hunter's book The Guitar Pickups Handbook. Click HERE to purchase the book on-line. How did you get started in the pickup business? Back around 1971 I found this book called Classical Guitar Making, by Arthur Overholtzer, and that was the one that got a lot of guys started. I thought, "Man, that's what I want to do. I want to build guitars, and I want to play guitars." I built some stuff when I was in junior high and high school that were just lousy, horrible electric guitars. I went to school at Roberto-Venn [School of Luthiery] in 1979, and they taught us how to wind pickups back then, which I guess they don't teach any more. It was Semi Mosely and Bob Venn, showing us how to do what people call 'hand winding' now, which is actually guiding the wire by hand with a machine that spins the bobbin around. So we made some rudimentary pickups where we actually cut parts out with tin snips, and then cut some wood out on the bandsaw for the core of it and then glued these pieces together and then drilled holes for the poles, and that was your bobbin. They were kind of like Semi Mosely's version of P-90s, and we had a choice of alnico magnets just like Semi used, which were these segmented bar magnets that looked like a radiator, we also used ceramic magnets. That was your choice: "You use ceramic if it's going to be hot, and you use alnico if it's not," and there really wasn't anything explained about exactly what you can do to change the sound. It was really rudimentary, kind of what a lot of the pickups in the '50s and '60s on Japanese guitars were like: they were funky, and they didn't hold together very well. The humbucker pickups that we made were wound without bobbins, just a coil that we wound on a form, and you would pull the coil off this form and wrap tape around it. They were microphonic as hell. Then Bob Venn—I called him 'Bondo Bob', because he would use Bondo on all his guitars as a wood filler—would mix Bondo and casting resin and then pour it into wood pickup covers we had made with the whole pickup inside the cover, you flipped it upside down, and poured that mixture inside to seal it together. Now people are making wood pickup covers, but we did that back in the '70s and found that unless you use a really dark wood, if you use maple or something, it's going to get scratched up real quick. And end up looking like a maple neck. Yeah, it does that. So, I went through that school and got out and thought, "Oh, I thought I was going to be a guitar maker, but I don't really have any idea what I'm doing, at least as much as I thought I would!" But I made guitars through the '80s on a limited basis, and I got into a blues band and ended up playing two to five nights a week—so doing that, working a full-time job, and making the guitars as a third job, and that's how I got by. After about ten years of playing clubs like that, which taught me to show up on time, and do a good job, and perform at 150 per cent, and be responsible, I had learned how to get the job done. Also hanging around on the club scene, with all those different types of guitarists, helped me form a valuable perspective on the needs of musicians that I use daily. I have a collection of vintage amps that I use to design my pickups on. I have a vintage Vox AC30, a vintage Marshall, and around ten different vintage Fenders too, and those are also invaluable to the process. So the experience of knowing what you're up against in a live situation and a recording situation helped me a lot in this business. When did you decide that winding pickup was the thing to do? I got to the point where I didn't want to play clubs anymore, so I started this guitar business and got serious about it, and spent a few years making guitars and getting the jigs ready and putting the shop together—this is in 1992 or '93. And I started thinking, well, I live on an island and there's a limited market here, and I didn't know how people were going to buy my stuff, unless I went to Seattle to push it. As I was kicking ideas around, I decided to write a book as a way of getting my name out, and then to sell guitars. I looked around to see what ideas there were that no one had written about and it happened that there was no material on the actual hands on procedures involved in making pickups. About the same time I found that when I would go to a show and have an archtop with my pickups on it, when people found out I made the pickups they became really focused on it—"Wow, you wound your own pickups?" I'd have this beautiful archtop, and the ultimate guitar-making achievement is to build a good archtop, and people would just be like, "Oh, you made the pickups!" 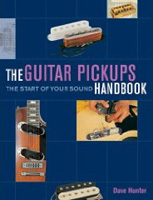 So I thought, "Well, I'll write a book about making pickups." So I do that, and then all of a sudden everybody wants me to wind pickups for them. People saw that book and thought, "This guy can make pickups." They'd either come to me with an unusual problem for something that needed to be made special, or they just couldn't get what they wanted from what was available. Also, just after the book came out I started hanging out on the Steel Forum on the internet, because I played steel, and I found there was a lot of demand for new pickups there. This was around 1996, '97. They started sending me all these old pickups, and I was learning a lot more than I already knew by taking them apart and fixing or adapting them. I found if there was something I needed to know or didn't have access to, I could go on the Steel Guitar site and say, "Can anyone lend me a 1937 EH-150?" and they would do it—they'd send it to me. Yeah, and I started doing a lot of custom stuff. People would call me and say, "Most of the pickups I've tried are too bright, or they don't have enough output, or they have too much output," or some kind of specific thing they were looking for. So I'd custom-make stuff for them, and after hundreds of people I'd start seeing patterns in what they wanted in specific kinds of pickups. For instance, with Strat pickups one of the things that comes up a lot is that the top end is so bright that it sounds brittle to people. You can break it down into several groups of different qualifications of what people want. Once in a while you'll get someone who wants something that's just out of left field, but there are specific things that people follow. My whole stock pickup line came from doing custom pickups and determining what people wanted most, from the requests that I would get over and over again. And then, the other thing that is really cool about how this all happened is that I "let it" grow really slow, I actually held back growth, as much as I could, so that I could get all my ducks in a row with my inventory and my R&D. If I'd let it go balls out and gotten as many dealers as I could from the get-go, I wouldn't have had as solid a foundation. It's interesting that the market was there, given that by '95 or '96 there were some major replacement pickup makers around already, and they were making some vintage stuff, but a lot of it was more in the pumped up, high-gain, hot rock realm. I think Seymour [Duncan] had just started doing the Antiquity line, right in there somewhere. So the real boom in vintage-repro pickups was still more in its infancy. Of course companies like Seymour Duncan, Dimarzio and Bill Lawrence opened the door for after market pickup demand 10 and 20 years previous to that time. These days, it seems like one of the biggest sectors of the market involves players' efforts to get the best vintage tones out of their replacement pickup. Whether they are authentic vintage tones, or slightly modified—idealized—vintage tones. Yeah, a lot of people want that today, its what most of my business revolves around. Yeah, a lot of new people... I watched it grow from a handful of people to more than you would probably be able to find if you started keeping count of it. ...There was still enough demand to make it a viable business model. Yeah, and the drive was and is not so much for a completely accurate vintage sound, but often players have that sound in mind, with some other specific requirement in mind to modify it slightly. But man, yes, it grew way beyond what I ever expected. The business doubled every year for a time there. I see lots of makers that are pretty well known now who say, "I bought that book and started out of that." Oh, my god...! Now, every week I see [some new pickup maker] on the internet. My book has been out of print for about four or five years, and they're going for $250 on the internet. Some of these guys claim that they custom-make a different pickup for everybody, but they must be working out of some kind of specification even if they don't acknowledge it. Sure, and after a while they probably have certain variations, but many fall into the same camp. Yeah you have to work off prior experience if you want a predictable outcome, and you have to look at it like, these pickups are going to be around longer than I am; people are going to resell them, and they're going to want to know what it is when they resell them, so it's better if you have some defined models to offer. There's a lot of misinformation out there about pickups. Do you have any pet peeves that you like to dispel? For one thing, somebody came out with some specs at some point—some of it, I think, goes back to that Donald Brosnac book (Guitar Electronics for Musicians, Beekman Books, 1995)—and it has just been reprinted and reprinted, over and over, and nobody has ever bothered to check it out. What kinds of specs are these? Oh, like windings, turn counts, specific resistances, the types of magnets used, and blah blah blah, and I've found that a lot of it doesn't match up. Somebody will write, "Vintage Fender Pickup Specifications," and then they'll list models with different specs, and a lot of it is just not right. Also, one of my pet peeves is that there's so much information out there, but there are a lot of guys who are just kind of like hobbyists, but they'll post on the internet and everybody reads it and assumes it's correct, even though these guys don't necessarily know what they're talking about. Every once in a while I'll get somebody calling me up and they'll go, "I want you to make me a pickup with alnico III magnets and 7,000 turns of heavy-build Formvar." And I'll ask, "Well, why do you want that?" And they'll say, "Because it'll do this and that and that..." I'll tell them I can do it for them, but I'm not going to guarantee what it's going to sound like. Most of the time when somebody comes and tells me how to build the pickup, they wind up not getting what they want. Any more, I won't do it without a compelling reason, and I'll tell them that. The internet is great for putting everything at your fingertips, but at the same time a lot of that 'everything' is misinformation, in all walks of life. You've got professional news journalists covering important events, but you have all kinds of bloggers covering the same 'news'. Once in a while a magazine will call me and actually fact check, and that's a great thing. The good thing about the internet is how it equalizes everyone's chances to be seen—you use to have to take out ads in magazines at great expense—it took a lot of money and dedication to get something going but now anyone can reach out and contact the whole world. The good thing about the old way was it would weed out a lot of people that didn't have a good business plan. When it comes down to it, it really doesn't matter if you can do good work if you can't do it consistently or in a timely manner. You also need to be responsive to receiving questions about your product, or when it's going to be delivered. There are all kinds of crazy claims out there about the way the great pickups were originally made, but what are some of the keys to 'the vintage tone'? This'll tie into your last question about pet peeves, and that is the fact that just because it's 'hand wound' doesn't mean it's good. There are a lot of people claiming, "Oh, I can take your Epiphone pickups and rewind it, and it's going to sound great." But the coil is just one factor in the thing. The materials that the pickup is made of have as much to do with the outcome as the amount of turns and the type of wire you use, and how you wind it. So on a Fender, with its type of coil, it's really important that the magnets you use have a good sound to them. These magnets, alnico magnets, are a combination of different metals mixed together, and there are impurities in that mix, and the actual recipe for the metal has a huge impact on the tone. You can get an alnico V from one factory that makes magnets and an alnico V from another factory, and there can be a huge difference in the sound. So you've got to go through and find the magnet source that you can work with. Then, old Fender pickups—for instance, a '62 or '63 Strat coil—you're going to find that the power of the magnet is about 20 per cent less than if you took that magnet and put it on the magnetizer and charged it back up. That's important too. It's a lot easier to put the pickup together with the magnets unmagnetized, because you don't have to worry about getting metal shavings on them and they're easier to handle, they don't bounce together, and there's no chance of getting a magnet put in upside down, if you charge it after it's all put together. So most makers charge magnets after they put them together, but it results in a different strength in the magnet. Do you put them in already charged? I put some of them in already charged, and some I charge after assembly. Most of my Fender pickups with alnico V, I put them together already charged, and there's a specific range of level that's about 20 percent less than if you fully charged it. So that has a lot to do with the treble quality. It makes it a little sweeter, a little bit less brash. That's one aspect of it, and like I said, the material itself—you'll hear subtle differences from one batch of alnico V to another batch, and you can sometimes get overtones that are inappropriate to the rest of the tones. And just the shape of the coil. Take a Strat coil; you can get quite a different tone out of a Strat pickup by making the coil a little bit shorter or a little bit taller. It makes a measurable difference. You can hear the difference in as little as a 32nd of an inch. If you make the pickup taller it'll make the pickup a little more focused sounding, slightly brighter, a little clearer sounding. It sounds like it almost corresponds a bit with the way the string-sensing area, the magnetic window, is working anyway. Yeah. Of course, with a Fender Strat pickup your magnetic sensing is going to be a pretty typical shape because of the design. That's the way it is. Does this have anything to do with the differences between Strat and Tele bridge pickups (although I'm aware the Tele bridge structure and the base plate affect that pickups performance, too)? The coil shape isn't all that different. It's pretty similar. The big difference is that metal ashtray bridge. The bottom plate of the pickup being metal makes a very subtle difference, but that bridge, that's where you get a 15 or 20 per cent boost in volume, midrange and bass. You take that plate away and just use a Strat bridge, or put a Telecaster bridge pickup in a Strat, and it doesn't sound like a Tele. Yeah, and you've heard those guitars—what's your experience with them? Well... they don't really sound like a Tele, to me. No. That ashtray bridge is a huge part of it. It's a fascinating structure, because that tone is the result of a combination of so many factors. And the bridge pieces themselves, what they're made out of—the saddles, and all that, contributes to the tone. But to pick up where we were before, the height of the coil, the tension on the coil—how lose or tight it is, makes a difference—how microphonic the coil is, makes a big difference. You mean not microphonic to the point where it's actually honking and detracting from the performance of the pickup, but microphonic in more imperceptible ways? Right. When we make stuff, there's a specific length of time that we will pot it for. On Fender-style pickups, the waxing actually helps hold the pickups together, that's one of the things that binds the whole assembly together. If you don't wax the coil at all, if it gets bumped or the guitar gets dropped, it can knock the coil loose and it will become more microphonic. That's really common with old, vintage pickups. So when I pot stuff, I have a vacuum potter, and I throw the pickups in there and I only pot for between ten seconds to a minute and 45 seconds, depending on the application is unless somebody specifically asks for something that's waxed really heavily. Generally it's just a light potting, because microphonics are part of the sound. You don't want them so microphonic that they're going to be unusable, but if you have them completely dead, most people will hear that if there's no microphonics at all. How much difference that makes if you're playing with a big band in a crowded room... probably doesn't make a whole lot of difference. Well, like a lot of these things. People hone their tone at home, then they know what they've got, and they feel good about themselves. Yeah exactly. At least it gives you a place to start from. P-90s are such a different kettle of fish. What are some of the nuances with that design? That's the same thing, regarding coil shape, and of course it's a much wider coil. You've got people that are selling a "P-90" that fits in a humbucker. Well, if you notice on a humbucker there's only actually a quarter-inch space between the end of the pole piece and the end of the pickup. It actually needs to be about a half inch [on a P-90], so they take the coil and they make it taller, like a Strat pickup, so it'll fit in there, and it changes the whole nature of the pickup. And those P-90s are long pickups, coil wise. Way longer. You can take any pickups and make it shorter, or wider, and you'll hear a big difference in tone. That's one thing about the P-90, the shape of the coil. Then another is the shape of the magnetic field, because it's using two magnets underneath. Two magnets also make a different magnetism in the pole pieces than one magnet; two magnets are a little stronger. But you get less magnetism at the top of the pole piece with a pickup like that than you do with a Fender, so you can raise that pickup up really close to the strings and it's not going to pull the strings out of tune. Yeah, I've heard people talk about not cranking the P-90 pole pieces up, but raising up the whole pickup—the entire coil—when you want to increase the power. Yeah, it works better. One thing I make is a shim for a dog-ear P-90 to raise it up, and it's exactly the same size as the dog-ear cover so you don't see it so much. That's important, to adjust the pickup right. The other qualities of the P-90 are what the pole piece material is made of, the size and the shape of the pole piece—whether it's got a round head or a flat head screw—and the type of material on the plate underneath, whether it's nickel silver or brass. Anything that's close to the coil, or the magnet, if it's, metal it's going to have some effect. Your P-90 replacements are highly regarded. I have been making P-90's since I started making pickups 30 years ago and I watched them go from a pickup no one really wanted to one of the more popular designs around. I've probably made more P-90s than anything else. I make a variety of them. I make an exact copy of a set of P-90s out of a '56 [Gibson Les Paul] Goldtop, and they don't sound like what people expect from P-90s. They're lower output, they're a real soft attack, they're brighter, they don't have as much midrange, and they're not snarly and gritty. They're sweeter and brighter, with less attack. Interesting. When I've played vintage guitars from that era that I have really liked, that's the sound that has appealed to me. But very often people, when they think P-90, think of the gritty, aggressive sound with the midrange hump. That's what they think '50s P-90s sound like, but it's not really the case. Same thing with humbuckers. The old humbuckers in dot neck ES-335s in particular, I've had quite a few of those in and most of them are around 7.2k [ohms, resistance]. What kind of readings are you expecting for genuine '50s P-90s? I've seen them anywhere from 6.5k to 8.2k. It depends, they vary a lot. If I had to pick a number I'd put them around 7.2k. The one that I sell the most of is around 8.2k, it's a little grittier, a little snarlier. It's the one on my web site. The more authentic '50s style version isn't actually listed, but I make it. A lot of it depends on the amp, too. If you're playing a Fender Twin, you wouldn't want a bright pickups. But if you're playing a Fender tweed champ, you wouldn't want my stock P-90 pickup, it would just be too much for it. Tell us a little about some of the less-considered factors regarding humbuckers. One thing worth considering is the pickup cover. People are always asking, "How much difference does that make?" And it can make anywhere from a huge difference to very little. What matters are exactly what the mix of metal that the cover is, and how thick it is. We went through this whole R&D thing that took months, to get these pickups covers made, and we wound up having covers made that are quite a bit thinner than what is generally available. It's easier to make them shriek, microphonically, so I put them upside down and pot them for 30 seconds so that it dampens the cover. But it doesn't really get into the coils very much. It's still microphonic, but the cover doesn't ping. I have read Seth Lover saying that, sure, the covers on humbuckers reduce the highs somewhat, but he designed the pickup with that in mind, so he has accounted for that fact. Yeah, and it smoothes the sound out too. I designed mine with the same considerations. I stayed out of making humbuckers for many years. The big deal about doing them was getting consistent parts. We're one of the few companies that can actually make parts in house, but to do humbucker parts, like the covers, it was going to be $20,000 to make a stamp. Then you've got to make a run of them. For the base plate, it was going to be $15,000 to make a stamp. So if you can find parts off the shelf, that's the way to go with them. But we won't use just anybody's parts, and that makes it difficult too, because if there's any problem with the supply chain, there's only one place you can go to. And my company is all about consistency. Consistency, service, and expertise. Are you finding there are any different tricks with getting humbuckers right, in order to please the players who want them, compared with getting your single coil styles right? With humbuckers it's more difficult to gauge people, because it's almost like a different type of guitar player than the single-coil guy. A lot of the humbucker guys are used to having all that padding around the note, but with a single coil it's almost like you're naked and in the spotlight. With a humbucker it's like you've got all your pals with you. So a lot of the public are looking for something that's a little bit softer and not quite so clear, with a humbucker. You've got to balance that, and we really don't cater to people who just want their humbucker to be loud and just rock out all the time. Most of the people who buy our stuff want dynamics out of it. I make three different models of humbuckers. One's an over-wound one, which is more like what a lot of people want who are a certain level of player; they're softer and creamier, and you lose a little bit of that definition, but they really do sound nice and sweet. Then my stock one, which is called the Imperial, is a step down from that in output, and the bottom end is a little bit tighter. You've still got some roundness to it, but you've got better definition. If you took a late '60s early '70s Les Paul, my neck pickup is going to be clearer than that. Les Pauls tend to make every note just like the last one you played, so my pickup should be able to go any direction you take it. It shouldn't color the tone too much, and if you want a harmonic out of it or a partial harmonic, or want to be able to clean it up by just playing it a tiny bit softer—all those things that the player puts in should come back out the other side. Again, I think your pickups—whether single coils or humbuckers—have found a market mostly with players that might be termed 'touch' players or 'feel' players, and dynamics is always a big part of that style of playing. Right. And also, my humbucker should have a little more treble than a lot of guys would think, so that it comes through and reaches the audience. You don't want too much treble, but you need a little more clarity than a lot of people expect from a humbucker. When I go play with guys that I usually don't play with, a lot of them put too much distortion on their amp, so that it gets muddy, and I'll kill 'em, because I don't have quite as much distortion, and I turn the reverb down, because there's already reverb in the room, and turn the treble up a little bit louder than you think you want it on stage, because the sound's got to get out there. As they knew back in the day—the goal was always for more treble. Whereas you discover many players who craft their gorgeous, warm tone in the comfort of their own homes find it just gets lost once they get it up on stage with a band. Yeah. What sounds good in your bedroom doesn't necessarily sound good in a club. Which must make it a little hard for someone like you to please people all the time, because some guys are mainly looking for something that will sound great to them at home alone in the bedroom. Oh, you know, that happens a lot. They get it home and go, "I don't know if I like it?" Then they take it to the band, and the band's going, "Man, that sounds better than ever!" Are you finding that guitarists, by and large, are revising their thinking on what they want from replacement pickups? The early market was mostly in hotter pickups for players who wanted a little more oomph out of their setup, but in recent years guitarists seem to have learned that pickups like that didn't always result in the best overall tone. Absolutely, over time the quest has become more about more clarity and dynamics over brute output. Sometimes a weaker pickup will beat the crap out of a hotter pickup. I think originally players were going to hotter pickups because it was probably very obvious that the new pickup they put in sounded very different from the old one. There was no subtlety about it. When you first had that whole industry getting going, it was probably very important to make it clear that this product was doing something different. That's a good point. And also I'm sure it was a product of its time, and guys were largely replacing those late '70s Fender Strat and Tele pickups that weren't very good in the first place, and playing them through silverface Twin Reverbs that they couldn't make break up to save their lives. Right. Those amps really can make use of more bottom end and more output from a pickup. And it was a rock age, more than anything else. Sure. And sometimes a pickup that doesn't have as much output as another will actually sound louder than a higher-wind pickup. The higher-wind pickup will be distorting the amp, but the one that is clearer has more treble, so it just rides right over the top of that and you hear everything you're doing. It's like playing a Tele; if you're playing a Tele in a band, you don't have to rely on volume to be heard. Sure, and the other guy is sitting in with a Les Paul thinking, "How come this guy is cutting through so much better?" Yeah, "How come he's all over the top of me?" And that's what I was saying earlier: a lot of guys use a little bit too much distortion, and they just don't get a good sound out of it to begin with. So the whole thing has to all work together. If somebody call me up and says, "I want my Les Paul to sound like "ABC..." I had ten Les Pauls in my shop, and I put the same pickups in every Les Paul. Three of them sounded really dark and woody, three of them sounded really bright and snappy, and the other ones had very subtle differences. And then there's the player. How does he play? Does he play with a really thin pick, or a hard pick, or does he play with a pick at all? Does he even know how to play? And what's the guitar amp, and the speaker? I've got so many amps, and if the pickups doesn't sound good in one amp I'll just go to another, and it'll sound great. And I often wonder, "Why do people even want hot pickups?" How much more distortion do you need? One thing I have started to notice about some really good Les Paul or ES-335 players, is that they'll often plug into the number 2 input of any amp, just as a matter of course, before tweaking the rest of the controls. If they want a little more clarity and dynamics, they'll use that low-gain input so they're not slamming the front end of the amp with those humbuckers, then they can get the action happening later in the amp, at the output stage. And a lot of guys will never turn the tone controls on their amp at all—that's ridiculous. And the big guys, I hear it on records all the time, they won't have their [guitar] volume on ten all the time, they'll roll it down about 20 per cent, and you can hear that, it's a little bit sweeter. There are a lot of little things like this that were the standard tricks in the 'golden years' of tone, when they didn't have all sorts of gizmos to craft their sound, and a lot of good players are rediscovering these simple things, which are really all a part of how guitars and amps were designed to work in the first place. And the notions of slightly weaker, more dynamic pickups, and of non-master-volume amps... they seemed to come back into the general awareness around the same time, and they seem tied together in this thinking. Yeah, people often think of the same thing at the same time. I am a big believer in using the pickup selector switch and the volume and tone controls. I watched a lot of top notch older blues players in the early '80s and copped that whole thing about rolling the volume and tone controls up and down, that's when I really learned to use my gear along with more basic things like having the whole band use dynamics. I have this pickup called the Chicago Steel pickup, and it's fun—you plug it into a little amp and it sounds like a big Marshall, and you can still play somewhat dynamically, but you wouldn't want that sound all the time. But that's a ceramic pickup, and it works well for that application when you want it. What's your thinking on the use of ceramic magnets verses alnico in pickup making? Ceramic won't conduct electricity, so if you put a meter on a ceramic magnet it won't show any conductivity, so it doesn't affect the inductance of the coil like a metal would. When you put a piece of ceramic magnet in there, it's not loading the coil and putting more bass in there. Ceramic is really cheap, and [in the early days] they used it without tweaking the design at all, and that's probably why it got a bad name. The pickups were designed with alnico for the frequency response, and somebody substituted ceramic in there without any consideration to altering the design, so it just sounded hot, bright and nasty. But that Chicago Steel pickup of mine is ceramic, and it's also got a big hunk of metal in it. It's designed to work right with a ceramic magnet. And of course guys like Bill Lawrence or Joe Barden have put a lot of thought into making pickups with ceramic magnets, and they'll confirm that you work from a completely different starting point, rather than just swapping in a ceramic magnet where an alnico magnet used to be. Yep, exactly. It's really more about the design than about how some guy's winding the coil.